Finding affordable and comprehensive ways to E-File your taxes is not easy. Preparing for the tax itself is a challenging task. At times, we are occupied with so many things that we often forget to focus on minor details when preparing our returns and then ended up being audited. You have to keep your yearly financial history for tax returns. If you feel that you need help in filing your taxes, especially when you have multiple businesses, it is better to hire an accountant right away to do your bookkeeping. It will save your time when filing your returns. We came up with a few affordable ways to E-file your taxes. TurboTax is a very convenient software where you can file your taxes without paying a penny. Using an online software can be tricky, so you have to feel confident when using it. If you receive the regular W-2 form, you can use Turbotax for free. The process is simple and easy to understand; just follow the instructions. You can access TurboTax from your phone by downloading the mobile app. Based on the information provided, it also tells you if there is an audit risk on the return. Users can also access free live chat and seek advice from an expert. TurboTax also offers more advanced services for a fee. One of those services is SmartLook which allows you to have a live conversation with a CPA through video chat. If you are filing 1040A or 1040EZ and fulfill the following requirements, you can qualify for the free edition. H&R Block offers free tax filing through various mediums like phone, email, and one-on-one consultations at any of their branches. H&R Block has more than 12,000 branches. If you have a student loan or own a property, H&R Block is the right choice for you as it supports more forms, including 1040. You can say it is an advance edition of TurboTax. You can file federal and state returns with H&R Block. TaxAct is considered one of the best options compared to its competitors. It is easy to use and has features including email, resources, and guides to help you when filing your tax return. If your tax return requires more advanced support, you can purchase its “Freelancer” version for approximately $82.00 for state and federal tax returns. Whereas, TurboTax costs around $40.00. TaxAct does not offer a free desktop version, but you can still get the software for only $15.00. TaxAct is one of the cheapest software that you can use when filing for your returns. eSmart Tax allows you to file basic federal returns for free. It offers you free live support and audit support from a CPA. If you have used any other software previously and want to migrate your tax information to eSmart, you can do that conveniently and free. If you are filing for state tax, it will cost you around $30.00. Many counties in the United States offer free electronic filing for income tax returns. Although, they do have some requirements. If you qualify, they will actually file the return for you and suggest what you can do to get more money back. For example, Big Bend volunteers are IRS certified and offer free preparation for income tax returns in Leon County, Tallahassee, Florida. Preparing for tax returns is not at all fun, but it can be hassle-free with the right choice of your tax software. For simple tax returns, you do not really have to purchase an advanced version, however, it is important to find the software according to your needs. 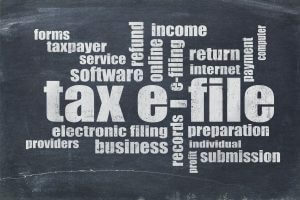 Many companies offer free software to their employees for E-Filing. If your income is more than $200,000, unfortunately, none of these will help you. The best thing to do in that situation is to hire a CPA who can prepare for your taxes and help you get the best results.